Royal Persian Coinage. ca. 350 to 340 BC. Silver 3 siglos. Map of Epheos region. 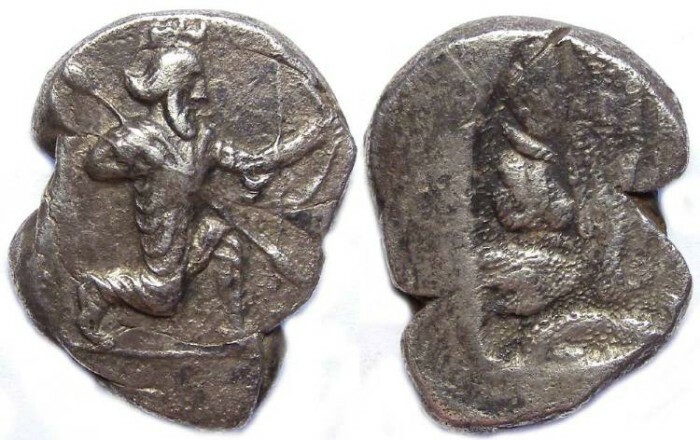 Denomination : Silver 3 siglos (tetradrachm). Reference : Trait� pl. LXXXIX, 8. Johnston, JHS 87, 23. Mildenberg, Studies Price, pl. LXI, 81. Size : 21.5 x 28.3 mm. Weight : 14.91 grams. Grade : VF fairly good strike. One scratch on the reverse. Valuation : The only nicer example sold in recent years that I can locate, was sold by K�nke Sept. 27, 2004, auction 94 lot 1061 for the equivalent of $18,500 once the buyers premium is included. Somewhat inferior examples have sold several times in the $900 to $2000 range. On the Ars Classica auction this coin sold what was then the equivalent of $3251 + 17% buyers premium which totals about $3800.00 US, but we feel it did not bring it's proper value because their image made the surfaces look much grainer surfaces it really is. so we have priced it accordingly at $4250 US. After looking at the Turkish governments topographical map of the region, I believe the interpretation of the reverse of this coin showing the hinterland around Ephesus is correct. This coin a very clear feature not noted in the listing when it was previously auctioned. It appears they made the flans for these by placing three sigloi in a crusible, then heating them until they melted togeather. On most specimens there is no evidence of this process, but on this specimen the sigloi fused togeather but did not fully melt. The result is that one can still see the fused joints between them on the obverse. If you look closely, they are visible on my image.